I was using a temperature sensor DS18B20 with Arduino. I've read that you should connect the digital input line and the 5V line with a 4.7kOhm resistor - like in the picture. Can someone explain why do we need to do this? And why this resistance? What happens if we don't put a resistor at all or use a different resistance? Q: Is the 4.7kΩ resistor needed for 5V and 3.3V operation? 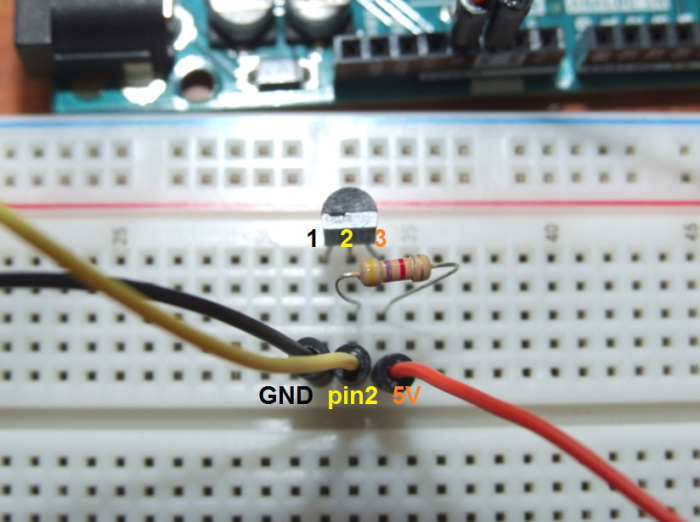 A: Yes, the 4.7kΩ pullup resistor is required for both 5V and 3.3V applications. powered by an external supply on VDD. And why this resistance? When the device doesnt have its own power supply it uses the power going through the pull up resistor-thus with this resistance it is powered properly. Also the other reason- as Jose wrote is because it the value which differentiates high or low bits. What happens if we don't put a resistor at all or use a different resistance? If you are going to you an out of spec value-dont expect the device to work properly because its using the wrong resistance-e.g. it may not work because if the resistance is too high-then according to ohms law it may not receive enough parasitic power. Though it should be able to tolerate the error tolerance of the resistor-so changing it by a few ohms either way from 4700 ohms will not make a difference. You may damage the device without a resistor. Why should I put a 10K resistor with an LDR?